In March 1937, Edith Piaf began her career of music hall at ABC, the most prestigious of Paris. From this period, her songs were adopted by the public and passed on the radio. In 1940, Jean Cocteau wrote her a piece for the theater the Bel Indifferent. She played with actor Paul Meurisse, her new companion. In 1941, she played in the film by Georges Lacombe Montmartre-sur-Seine. During the war, Edith continued her career in Paris and sang to Berlin. She sang a few double-sens songs. She protected Jewish artists and her secretary, member of the Resistance, testified that she allowed at 118 French prisoners to escape from Germany as members of her orchestra during several years. On March 13, 1937 is set to 29° 11′ of Scorpio. It has a Powerful force because conjunct with the Ascendant and the transit of Mars situated at 0° 14′ of Sagittarius. The degree of the year is situated at 6° 31′ of Virgo. It has a Very Powerful Force conjunct with Midheaven and Mars. At twenty-one years and two months, he announces the Mercury-Moon period. The Moon has a Very Powerful force in House VII for a nocturnal birth. The degree of the year has a Very Powerful force because it is situated at the Midheaven in House IX. In this position near the Midheaven and from 21 year old, it confirmes her success in music hall, radio, theater and cinema. The Moon is the master of the planetary period. It has a Beneficent quality and a Very Powerful force in House VII, that of contracts. It announces the success of her various commitments. The degree of the day has a Powerful force because conjunct with the Ascendant and the transit of Mars that appears as governor of degree and also in transit. It has a Beneficent quality as master of Triangle in nocturnal birth in Leo at its natal position and in Sagittarius. 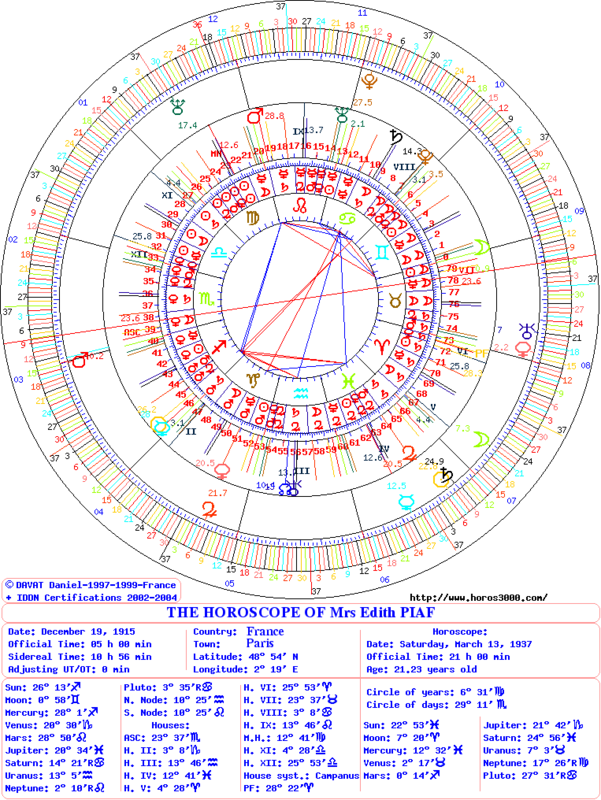 On March 13, 1937 is at 29° of Scorpio conjunct with the natal Ascendant and House XII of SR. 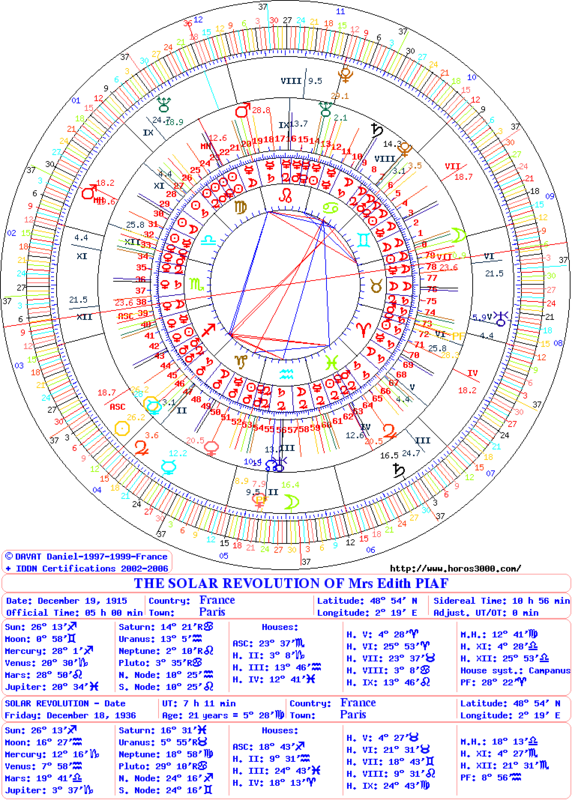 The degree of the year is situated at 5° 28′ of Virgo conjunct with natal Mars, natal Midheaven and in House VIII of SR. Both Suns in Sagittarius are conjunct with Ascendant of SR, both Mercuries and Jupiter of SR. This stellium determining of her career thanks to Suns influences from March 23 during the time of her show at ABC. This entry was posted on Friday, April 25th, 2014 at 4:09 pmand is filed under Edith Piaf. Both comments and pings are currently closed.